Photoblogging Lansing Pt. 2: Trains, Trains, Trains. 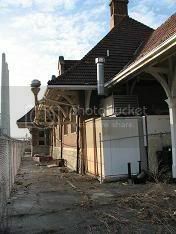 Following up the last post on Amtrak, here's a bit of photoblogging and wishful thinking on Lansing train depots. 1. Clara's Restaurant, located in the old Lansing Central Station near Michigan and Pennsylvania Avenues. 2. The Grand Trunk Western Depot, on S. Washington. 3. The East Lansing Intermodal Station, on Harrison and Trowbridge. 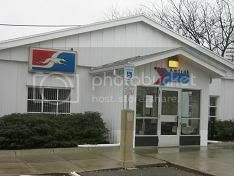 The Amtrak Blue Water train hurtles by two of these stations, but only one of the three stations is operating: the East Lansing station. Wonderful for MSU, but it makes you weep tears of sorrow from an architectural standpoint. 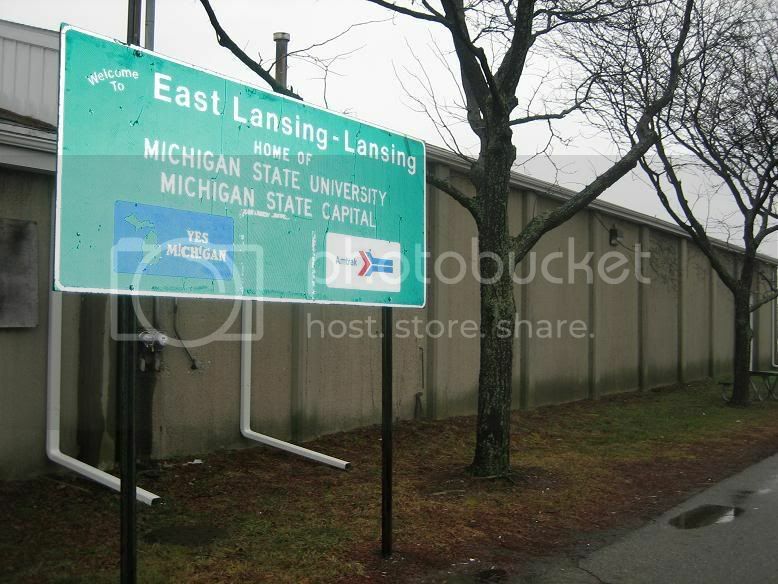 The East Lansing station. 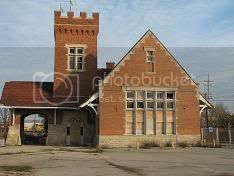 When Amtrak decided to re-instate the Chicago-Toronto (now Chicago-Port Huron) line, they had already sold the Lansing Grand Trunk station. 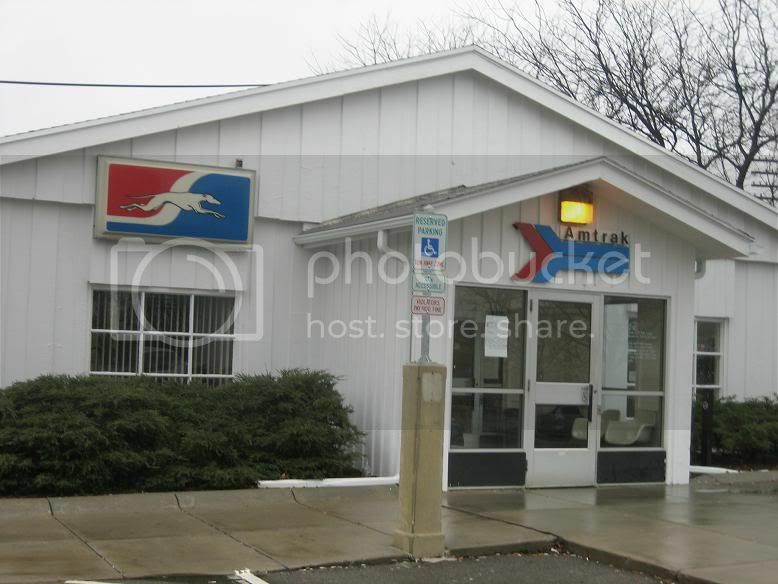 MSU sold Amtrak an inexpensive storage house, and passenger rail returned to Lansing. 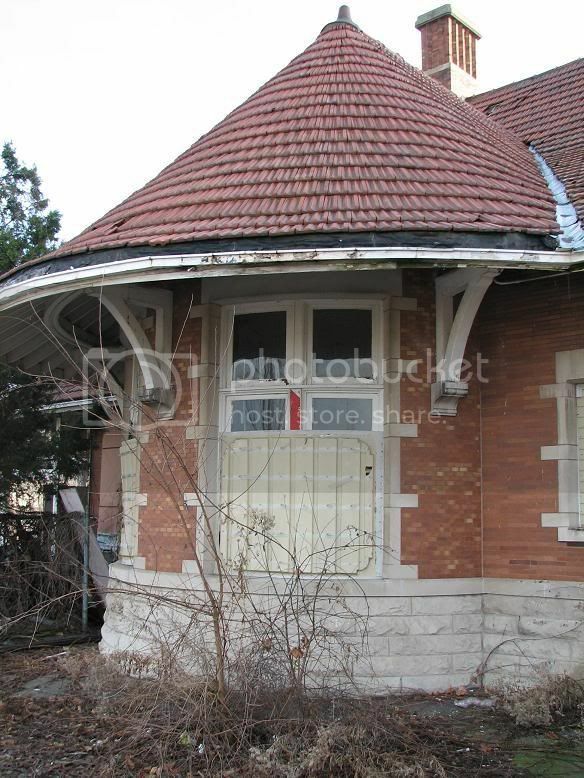 Yet it did not have an ounce of the majesty carried by the former Lansing depot down the tracks. 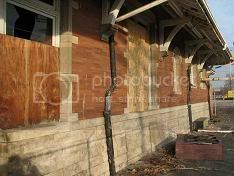 The Grand Trunk Depot is a gorgeous building, but with each passing year it falls further into disrepair. A shame, because it is located in the heart of the redeveloping REO Town neighborhood and just south of the Capitol District. The station served rail passengers until 1971 when it was sold and converted to a restaurant in 1972. Growing up, I remember the restaurant held little of the charm of the gilded Clara's, and it came as no surprise that as the neighborhood declined, so did patronage: the restaurant was eventually closed some time in the late 90's. Time has not served the building well. The stone structure remains beautiful as ever: red brick with white accents, and a striking tower and circular room on the north side of the building. 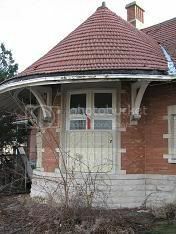 But the grounds, woodwork, and windows are a different story. Although it has ample parking and the neighborhood is turning around, the lot is overgrown with weeds, and several windows have been broken in and subsequently boarded. 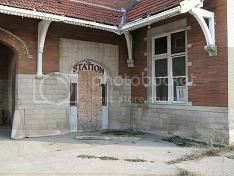 The painted doorway to "The Station" -- the moniker of the former restaurant -- is visible over the plywood haphazardly sealing the door from entry. The station was enclosed by a high, chain link fence on the south end of the station, possibly to prevent patrons from wandering onto the tracks and into the line of freight trains. 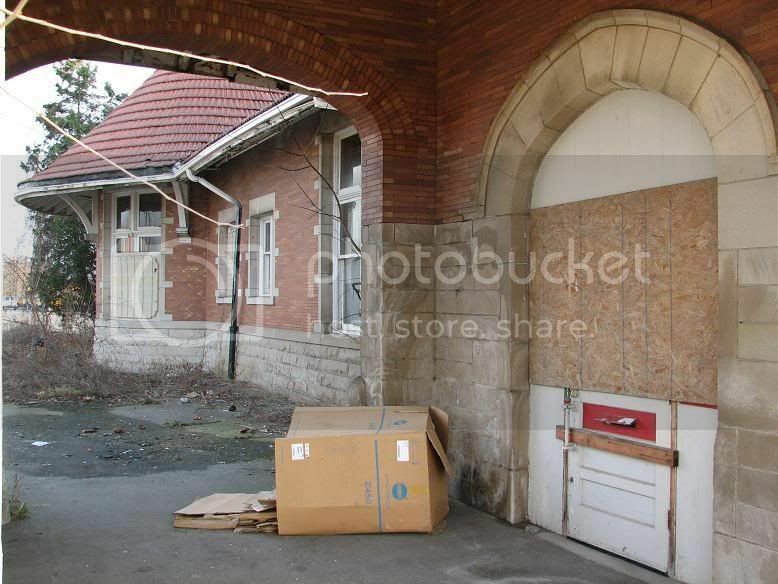 It now appears more like a cage to enclose the station from the world around it, only protecting the broken glass from shattered windows that litter the pavement around the 100-year old structure. 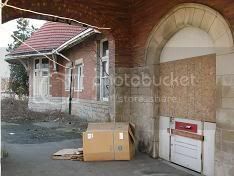 The east end is littered with remnants of the restaurants: tables, booths, chairs, boxes, crates -- all of the unwanted remnants of the station that have remain unmoved. 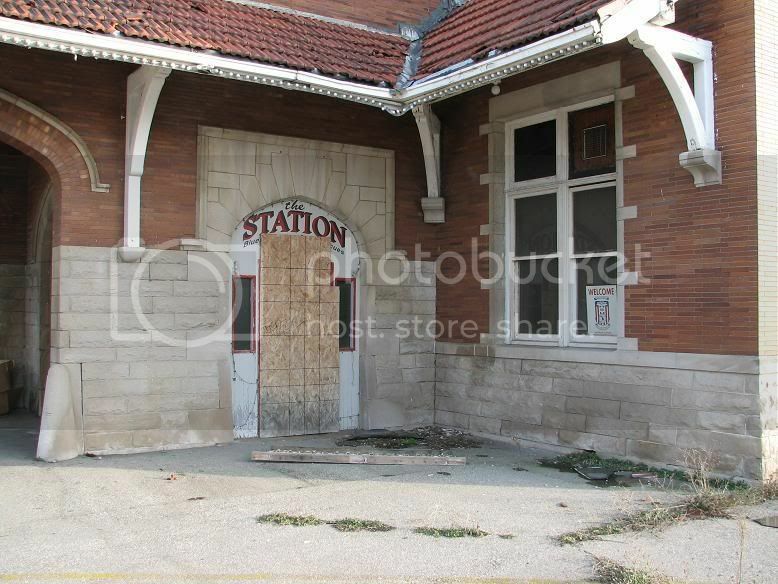 If restored, the station could add a vibrancy and renewed, historical feel to Downtown Lansing. It's a prime location with ample parking, and close to downtown, the Capitol, Lansing Center, and the Radisson -- but with a cash-strapped Amtrak, City of Lansing, and State Government, such a prospect is high in the clouds. It would be wonderful if Lansing could one day become a central hub for passenger rail in lower Michigan. The creation of a new route from Grand Rapids-Lansing-Ann Arbor could create an awesome educational and business travel network. And a renewed depot would add to Lansing's image and long-lost historical character. And besides, it would be super awesome. I say we call it the "Granholm Express." Excellent pictures! I agree, the Lansing station could be so much more. For what its worth, Ann Arbor's station isn't so hot either, and parking is terrible. As for the Granholm Express, I love the idea. Now, just extend that line south from Ann Arbor to Monroe, and then through to Toledo and it'd be even better. Oh, and add a little turn to have it go through Tecumseh or Adrian as well. Another option: East Lansing to Jackson, through Lenawee County, and to Toledo. Those of us in the border counties would love it! great pictures! 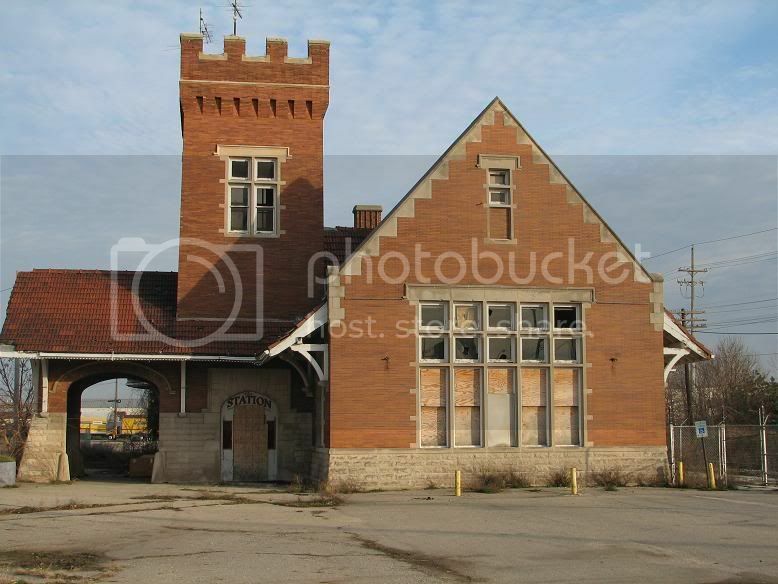 I used to work near the Grand Trunk Western Depot and I could never understand why it stayed empty. It's a great old building.